OptionWorld, in my opinion, is just like most SpotOption trading platform based brokers – attractive, user-friendly, appealing to newer clients but overall, just another Binary Options broker. I’ve seen many platforms just like this one; still, I prefer the unique Binary Options platforms much better. If you like SpotOption platform and I know many traders prefers this one over the others, then OptionWorld is here to fulfill your wish. However, I believe there are better brokers using this platform, with much better customer service. OptionWorld, launched back at 2011, is based on 100% web based SpotOption trading Platform, with no need for any software to be downloaded. 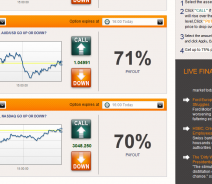 The year 2011, especially towards the end of 2011 and the beginning of 2012 was a great time for binary options brokers. 2011 was a breakthrough year for the Binary Options trading market, as more and more traders begun trading and more and more brokers took advantage of the modern trading platforms to attract new client. OptionWorld is an example of such broker – user friendly, medium high returns, fair refund, and good bonus but unfortunate for OptionWorld, bad customer service and very bad reputation for a relatively fresh broker. Many mails from frustrated clients, outrages complaints from former costumers and other negative feedbacks from OptionWorld traders pushed me to write a review about OptionWorld. Usually, I don’t believe a minor broker such as this one requires a review, but after hearing some horrible things about OptionWorld I’ve decided to take my time and review OptionWorld, to try finding out what’s the problem, and how can I prevent it from happening again. Two weeks ago I received an E-Mail from a guy who claimed OptionWorld had scammed him and wouldn’t let him withdraw his money. If I was naïve, I’d probably shout my lungs out to cry justice for this man. However, about 50% of these mails are associated with binary options brokers trying to trash about the competitors. Another 30% are frustrated traders who lost their money quickly, and now they feel someone else must pay. The rest of them, about 15-25%, have actually been scammed. When I first saw this mail, I felt like that’s the 15%. I felt that man is telling the truth. I started searching the internet for OptionWorld complaint, ironically that wasn’t too hard to. For a fresh broker, OptionWorld has quite a lot of complaints. That’s a bad bad sign. Now I don’t want to be the judge, but if I was looking for a Binary Options broker, I’d skip this one. Two days ago I received another mail, around 1000 words, another OptionWorld former client with bad things to say about this company. My advice- look for OptionWorld complaints and determine for yourselves whether they’re a fraud or not. When it comes to research, BinaryOptionsthatSuck.com team picks up every rock in the quest for information. What we do is very simple, and could be done at home – just type in OptionWorld complaints, scam or fraud on any search engine such as Google or yahoo. When we searched for OptionWorld, this is what we found: first, bots.com personally recieced a few complaints from former OptionWorld costumers, but not only us. 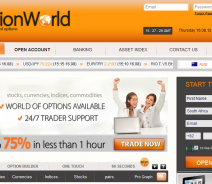 Compared to other fresh binary options brokers, finding OptionWorld costumer’s comments is quite easy. We found many clients’ complaints; some of them looks genuine, but should be revised closely. OptionWorld website offer 100% based SpotOption trading platform. The platform is smooth, very user-friendly. The design is nice, seems modern and professional, pretty orange. Total of 57 assets: 13 currencies (Forex), 6 commodities, 22 Indices and 16 Stocks available to trade is an average amount of assets in the Binary Options industry. There a few expiry times, also touch options for weekends. OptionWorld do not charge any fees while depositing, there is a commission charge of withdrawal via wire transfer, 25$. Withdrawal via C.C is free. OptionWorld Effective return is around 70%, which is between averages to high compared to other Binary Options Brokers. Out-of-Money is around 5%. The support is available via only 4 international numbers, one in the US, Spain, China and Australia. OptionWorld support is below average. Depositing is available via credit cars, wire transfer or moneybookers and more. The minimum deposit is 200$ for the initial deposit, minimum investment is only 5$ and the maximum is investment is only 500$ for a single asset. Withdrawal via C.C are only allowed up to the initial deposited amount, the rest of the profits are only available to withdraw via wire transfer, plus a 25$ charge per withdrawal. Bonus is quite extensive; I’ve seen promos of 100% bonus. OptionWorld enjoys the fine trading tools and trading options available on the SpotOption trading platform. That includes- Option Builder, 60 Seconds, rollover and close now options. The market reviews are not the best, but could provide certain info. Some of this info is out of date. I Joined Optionworld two weeks ago. After I deposited $500, the broker only traded twice on my account and on the second day he told me that the software expired and I must buy a new a software for $470. He told me that he cannot complete a trade therefore I won’t be able to withdraw the profit that was made for those two days. I am still shaken by the fact that this was not explained from the beginning. I don’t know if I will ever get my money back. I’m told by the broker that before i can withdraw the money, I must first pay R10% for tax. How true is That? How can I pay for tax if I haven’t received the money? I deposited $5000 to optionworld.com in 2012 and randomly trade once awhile. Now their website is not even there anymore. I wander if there is anyone have their phone number I can call? It looks like this is a kind of scam. The Option-World website became non-functional as of early December of 2014. I didn’t realize that this whole options website is a scam until now. Anyone has any idea how to get our money back? I been scammed by this site about 3,000 dollars does any one had a response? I am in that boat. I have been scam by opton-wolrd and Kristian Jacob. About 15,000 dollars. the kristian jacobs site doesn’t exist. Is there another way to band together and end these people for good? Attention All persons who have been scammed by Kristian Jacobs owner/operator of Option World, Binary Options Xposed etcetera. Many of you have deposited monies with his organizations and have not received a penny back(pretty much par for the course with this despicable man…well some enterprising brave soul has seen fit to put up a website; Kristian Jacobs.net The sole purpose of this website is for all persons scammed by Mr. Jacobs who can tell their stories on this site in order to warn all those who may consider one of his companies; binary Options Xposed, or Option World or, KRISWORLD ENTERTAINMENT for any business dealings. If you Google “Kristian Jacobs this is the second website that will come up under Kristian Jacobs.com. This is Great Xsposure to put this evil thief on blast so everyone knows NOT TO DO BUSINESS with this man!!! If you would like to add fuel to the fire; go to Kristian Jacobs.net and add your story to the website. Let’s put Kristian OUT OF BUSINESS, and put all other scammers on notice that this will no longer be tolerated!!! If you steal people’s money-WE WILL CALL YOU OUT!! Noel; send me you regular email at [email protected] I am gathering the people who have experienced the same thing with Option World so we may do something together to get these thieves permanently off the internet!! I traded on Option World from 5 July 2012 to 5 November 2012, satisfied the bonus requirements and then did a withdrawal application for the balance of my account of $7307.85.They have not acknowledged my withdrawal, they do not answer my numerous e-mails and do not answer any of their phones. I have even tried contacting Binary Options Xposed. Also they have never given the gift of an iPad. What do I do now ???? ?